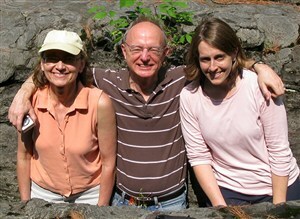 Droege had intended to become an earth science teacher. She switched fields. “The more geology courses I took and the more field trips I went on, the more I found myself really enjoying the science,” said Droege, a graduate student at Colorado State University who plans to work for an oil and gas company in Texas. Teamwork: Saint Rose geology professors Jacqueline Smith, Eric Eslinger and Stephanie Maes offer students a broad exposure to the field. And at a time when many college graduates are scrambling to find jobs, geology is booming. “I don’t have anybody who’s graduated who hasn’t been able to find a job. And if they’re not going into teaching, they’re going on to graduate school,” says Professor Eric Eslinger. He notes that Saint Rose graduates pursue positions in oil and gas exploration, energy conservation and education. Students credit the professors with exposing them to a wide array of specialties. Eslinger has a background in oil and gas, Smith teaches classes on structural geology and tectonics and Stephanie Maes teaches mineralogy as she researches the formations caused by volcanic events. Eslinger says that what the program really needs is more students. The jobs are not only plentiful, he notes, but often pay very well. The major, in fact, tends to draws more students who opt in than students who enter Saint Rose intending to study geology. This is in part because so many high school students have had little or no exposure to the field. 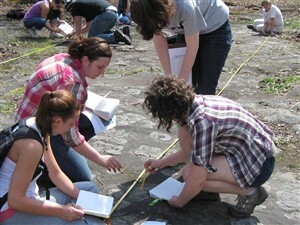 Saint Rose geology graduates, then, have a unique opportunity to help discover new and innovative methods of water conservation and management. I can’t think anything to study without science. I like environmental science. Its covers a broad range of topics, incorporating both physical and biological sciences and applying these fields to the sympathetic of ecological problems.